Welcome to the latest incarnation of Anime Diet! This is the sixth major revision of the website since its founding as Scattered Cels in late 2006, though the last one was more of an evolutionary upgrade. This one is a bit more radical, as you can see. We hope that things are a bit less cluttered and more clear with this new, clean layout, which is based on Maimpok by Padd Solutions. We would also like to extend a warm welcome to readers coming in from the Aniblog Tourney. 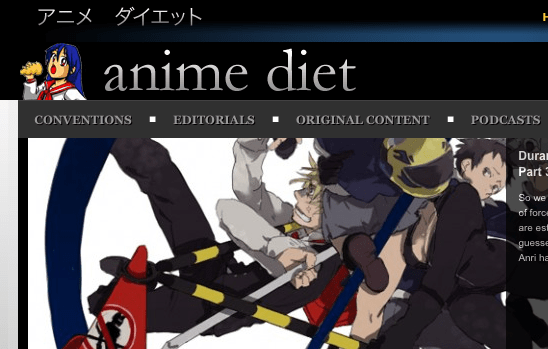 Thanks for coming to Anime Diet–we’ve been around for a while and we feel we have a lot to offer in the way of reviews, podcasts, and convention coverage. (There’s even more con coverage at our Youtube channel.) We would greatly appreciate your votes in the tournament, of course! One of the beneficial side effects has been that many bloggers have received constructive comments. We welcome those as well, in our comments section as well as on the relevant page at the Tourney site. Thanks for visiting! Again, if after visiting our worthy counterpart Anime Princess you decide you prefer us–vote Anime Diet in the tourney!